March 9 was a dark day. Ominous clouds collected, the Earth began to rumble, and students in Professor Jack Bosflair’s principles of chaos class braced themselves for what was to be the exam of their lives. Well over 100 questions. An hour and a half time limit. No multiple choice. Indeed, Dr. Bosflair’s students had quite the ordeal in store for them. As students trudged into their classroom in the basement of Hill Hall at 9:39 a.m., only the circles beneath their eyes, adorned only by dried tears, appeared darker than the sky above them. The sole exception to this was student Julie Windig, who had already peacefully given up and attended the exam for the purpose of witnessing her peers in pain. There they were. Dr. Bosflair entered the room with a briefcase made uncomfortably heavy with exam packets. Exhaustion had inhibited the students’ ability to be frustrated by his antics. Bosflair, or “J Boss” as his students call him, passed stacks out to rows in the class, and the students politely distributed them amongst themselves, exchanging looks of desperation with each other. Then they began. Briefly distracted by a loud clap of thunder and a torrential downpour outside of the window, students reluctantly brought their attention back to the exam. Suddenly, their shuffling began to escalate. Then came the chaos. 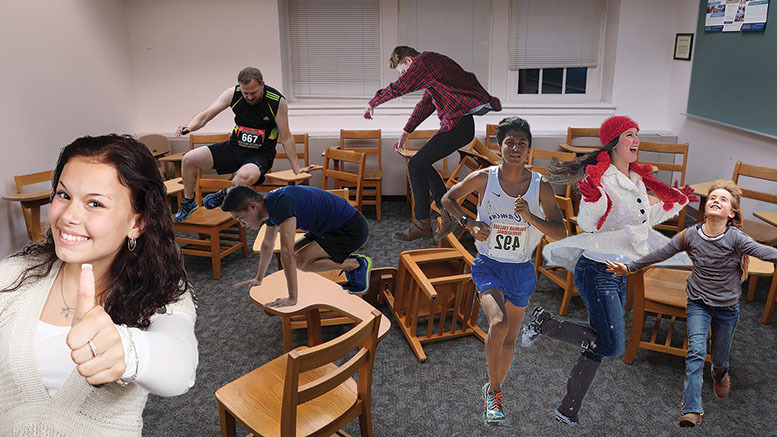 While some students began tearing apart their exams with an inhuman ferocity, others ran out of the room at record speeds. All students passed the exam.